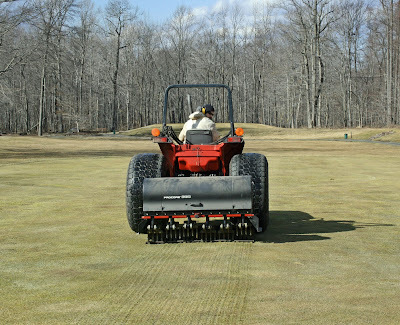 Greens Aerification Way Ahead of Schedule! 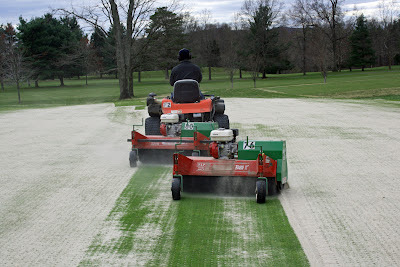 By day's end, twelve greens will have been aerified and topdressed. 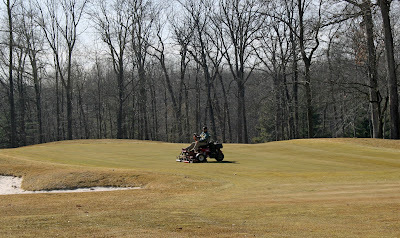 Our scheduled aerifcation of greens was planned to begin on April ninth, but the weather allowed us to get ahead of this schedule. The weather looks great next week and the plan is to complete the remaining seven greens on Monday and Tuesday. 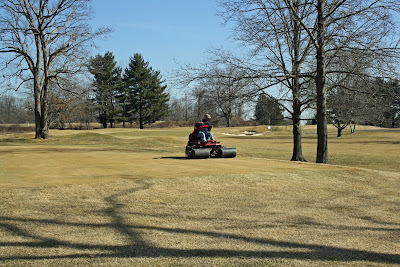 All greens will be open this Friday through Sunday (weather dependant... snow Saturday night???). 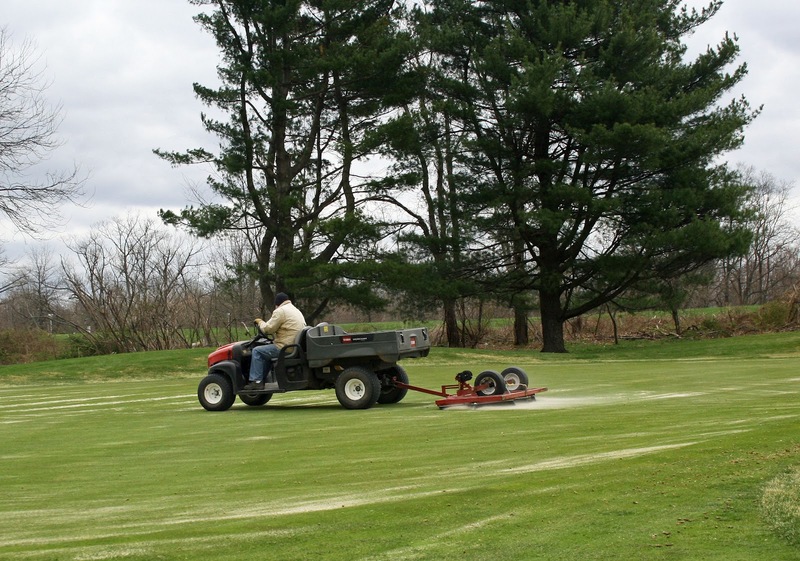 We plan to aerify the remaining greens on Monday and Tuesday. 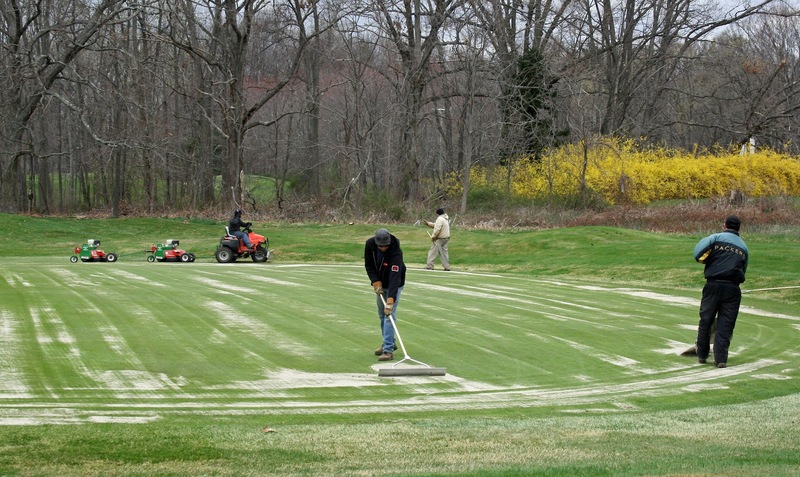 The remaining greens are: #5, 11, 12, 13, 16, 18 and the practice green. 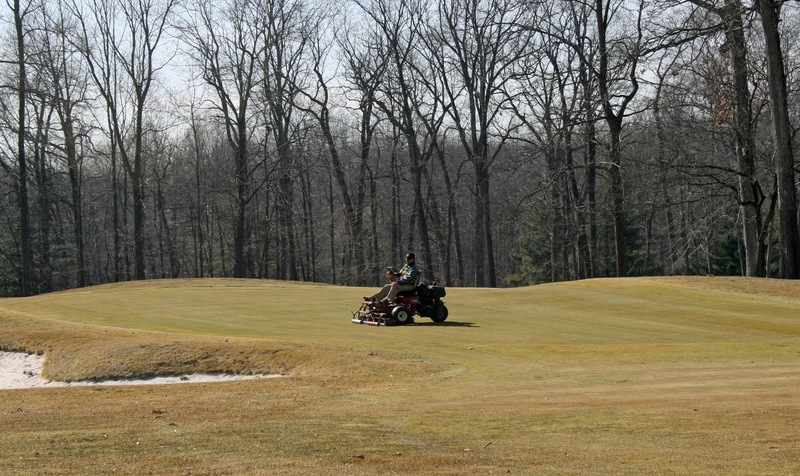 Regardless of what Mother Nature throws at us in the coming days, course conditions are far ahead of schedule! Maintenance staff moves remaining sand by hand to prepare for final "dragging"
The good weather has allowed the maintenance staff to continue working on cleanup and projects. Aerifying of the fairways has started and we are addressing areas that required renovations. 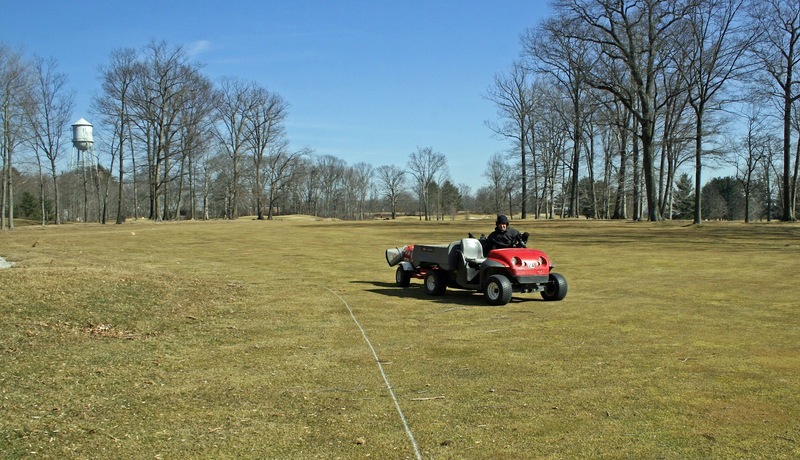 We are marking all areas with signs, ropes and stakes. 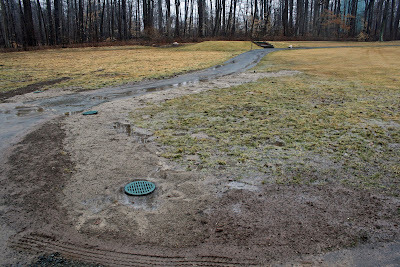 Please do your best to stay off the newly seeded areas. Thank you! Aerifying fairways with 3/4 inch solid tines. 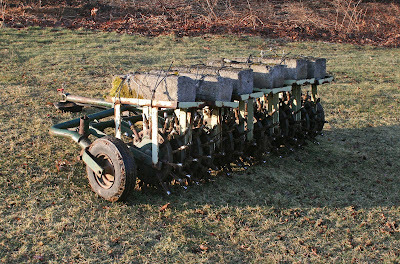 Old Ryan aerifyer used during renovation of #13 green surrounds. 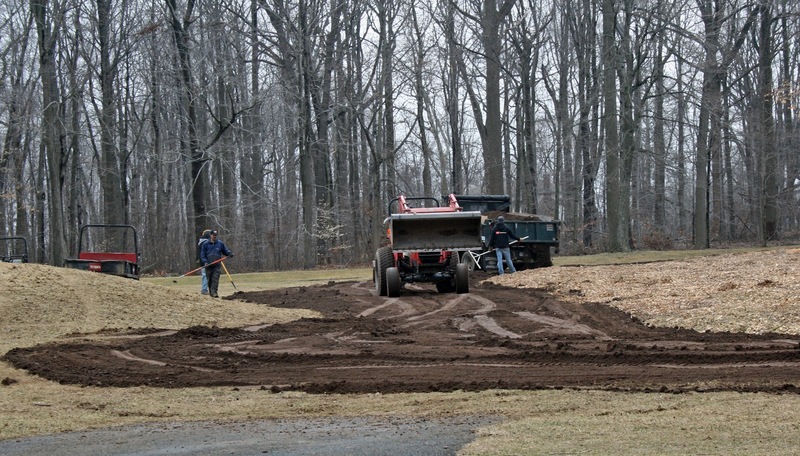 Topsoil being spread behind #13 green. Seed being applied to aerified and topsoiled areas on #13. Tine Harrow (large metal mat) drags in the seed, breaks up aerifying plugs and smooths all surfaces. Last Step: Topsoiled areas run over with knobbed tires of sand pro to provide good soil/seed contact. 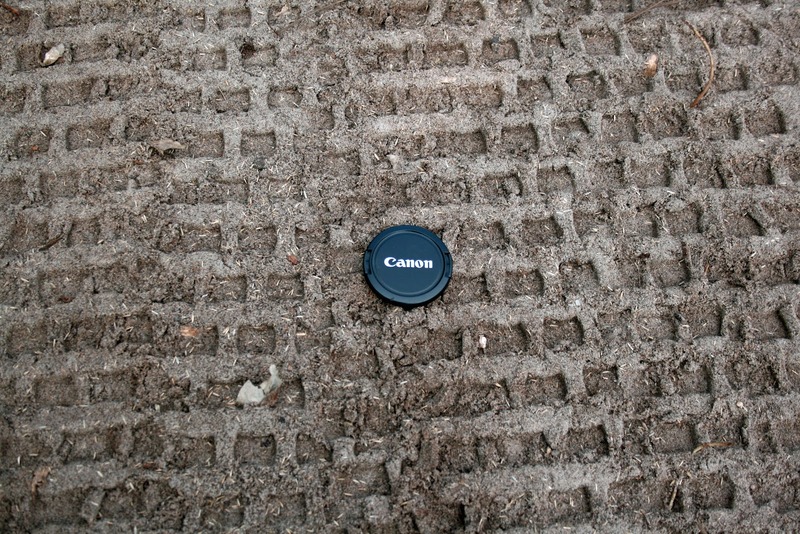 The visible depressions hold water which enhances seed germination. I am so excited I can barely contain myself! I am opening all of the greens except for number thirteen. Carts will be available on all 18 holes with no restrictions. 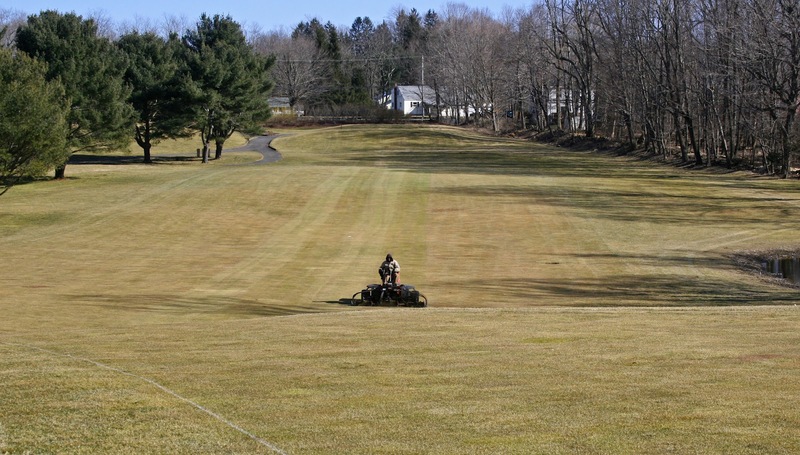 The course will open at 10:00AM to allow us enough preparation time. 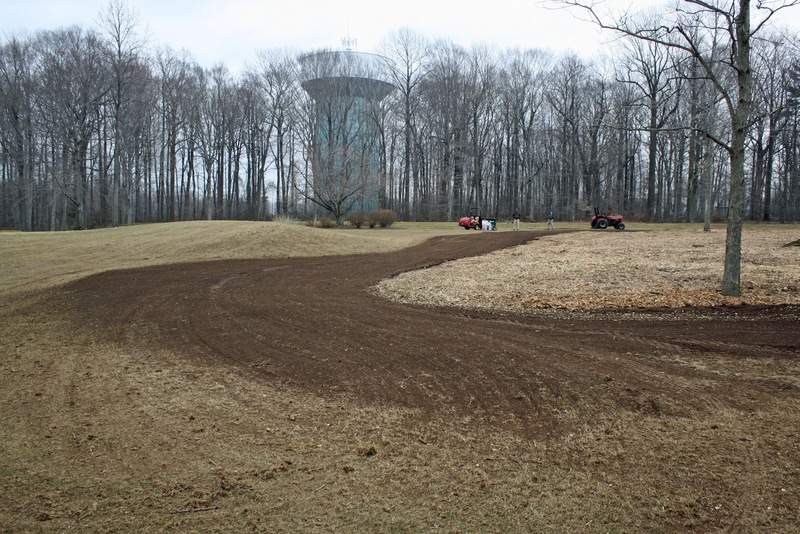 We are busy today preparing the course for opening. 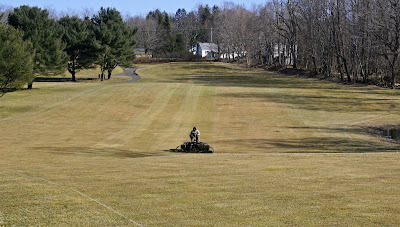 By day’s end, the greens will have been mowed and rolled along with fairways and tees. 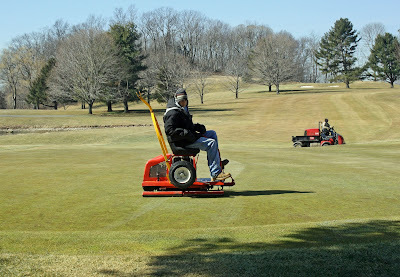 I could’t help but put the stimpmeter to use and see that the greens are rolling at 9.5 feet. I’m very pleased! We will continue our course preparations tomorrow and conditions will only improve. 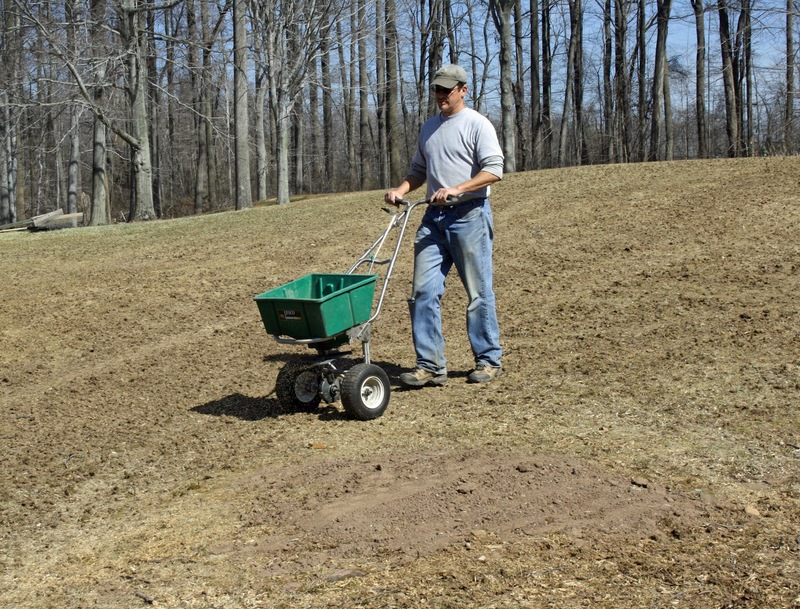 Course supplies will be put out as time allows. 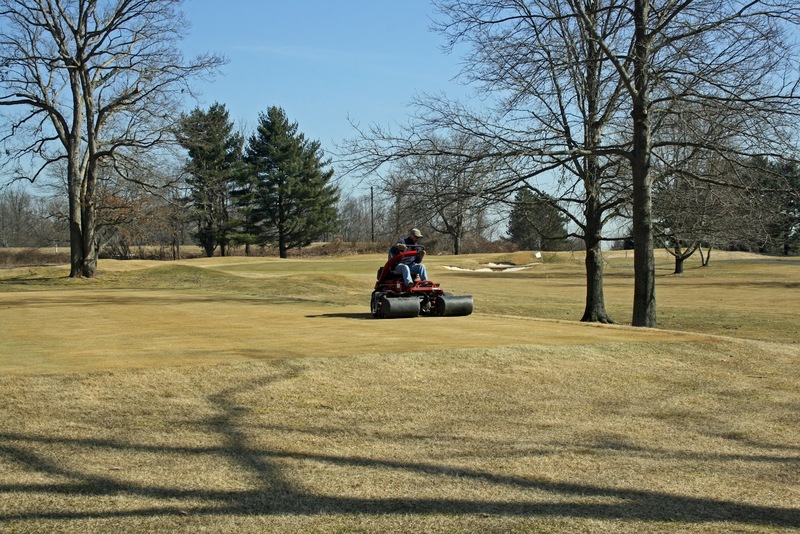 Be aware that this is the first week of March and conditions can still change. 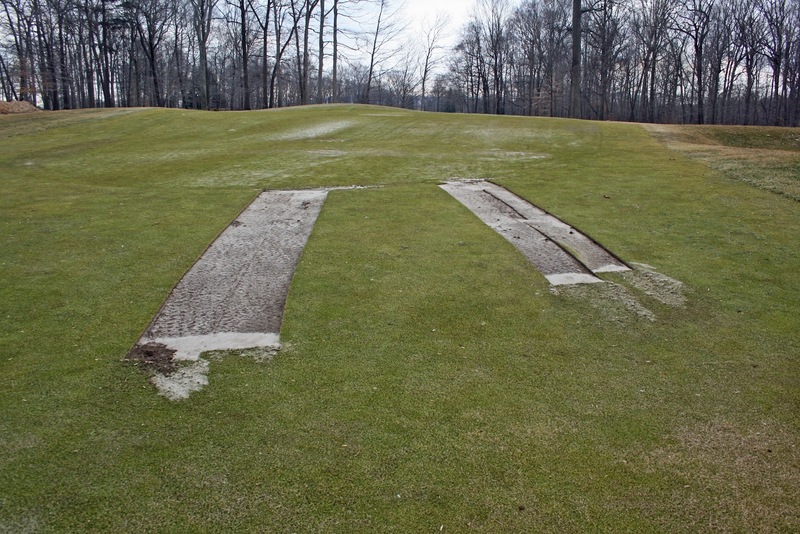 If the weather turns colder we may have to put the pins back on the temporary greens. 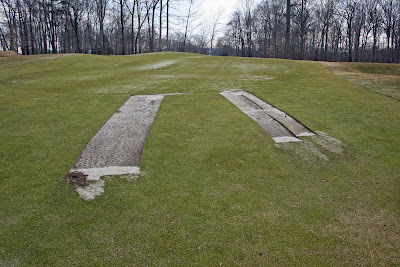 Hopefully this won’t happen and we can continue to enjoy the outstanding early season playing conditions! 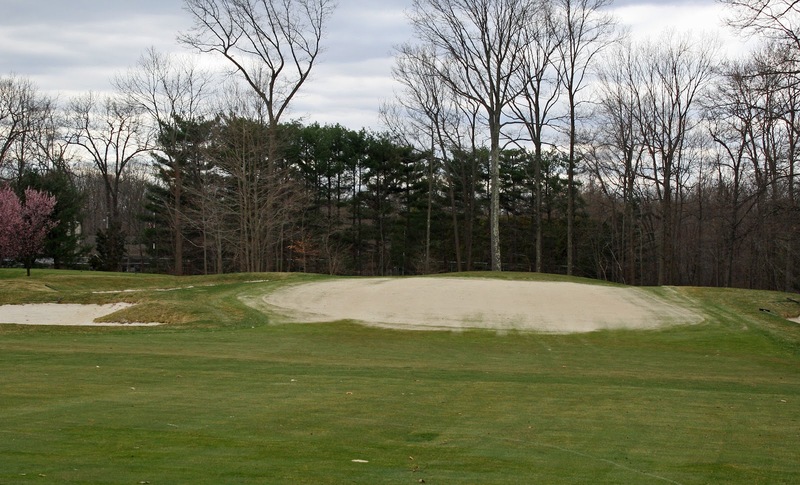 I look forward to seeing you on the course tomorrow! 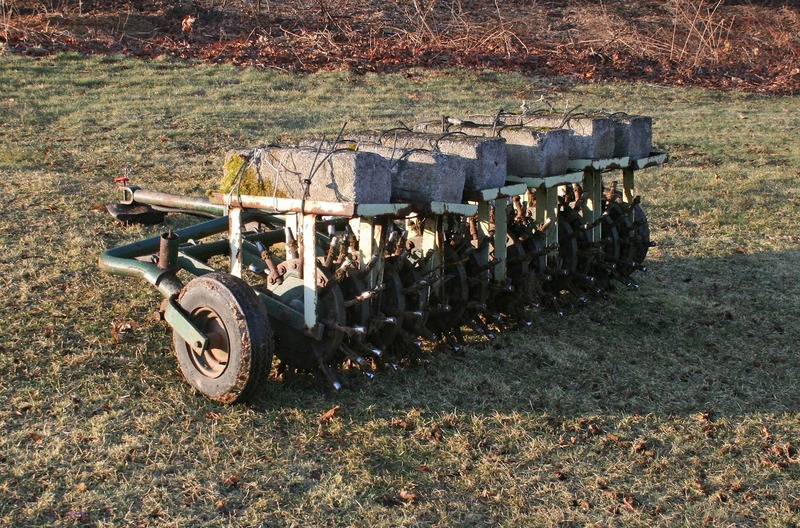 Don’t miss one of the earliest openings of the course in our fifty plus year history! 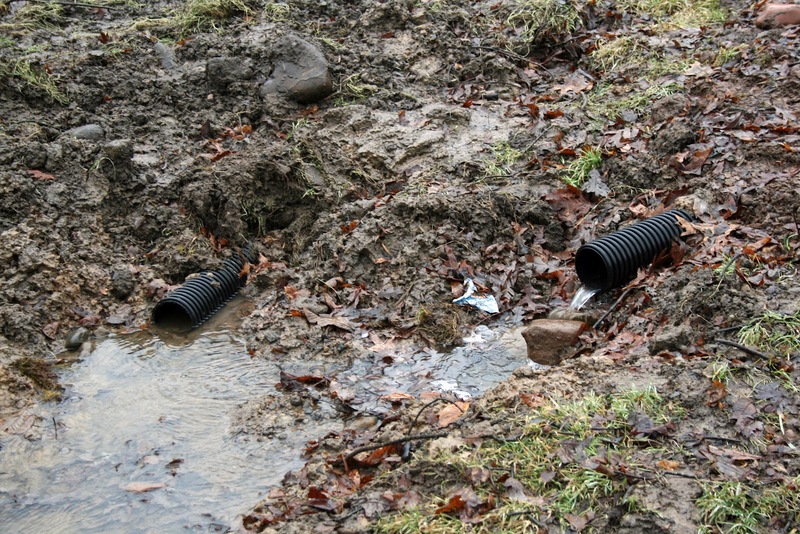 We are already reaping the benefits of our drainage projects! 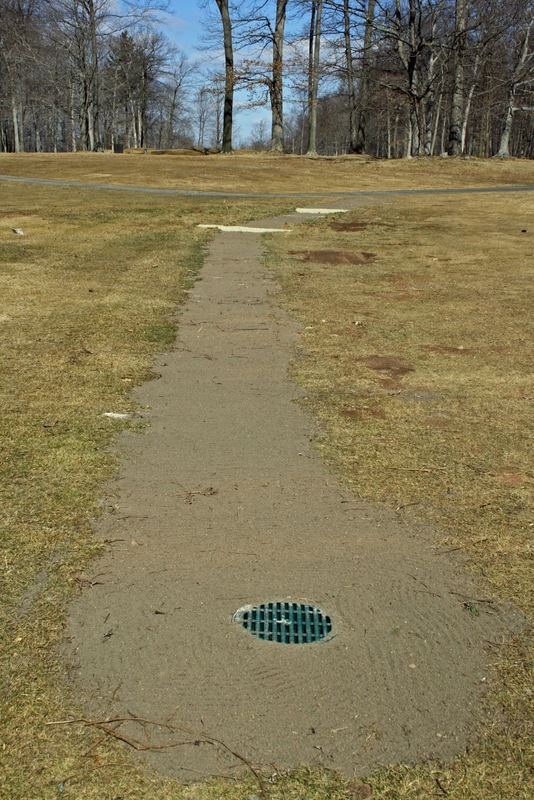 The areas we have fixed / installed drainage are working well and will be completed once the warmer weather arrives. 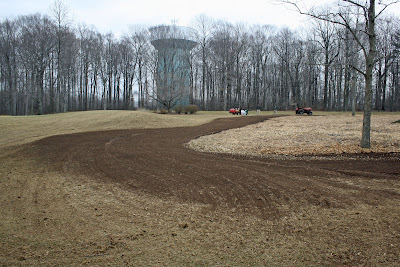 It is still too cold to do some minor finish grading and seeding. 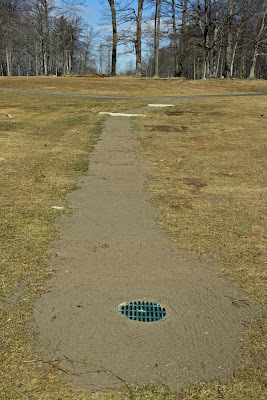 Basins, pipe and rough grade set and working well at #13 tee (3-3-12). Water flowing nicely from outlet pipe at #13 tee (3-3-12). 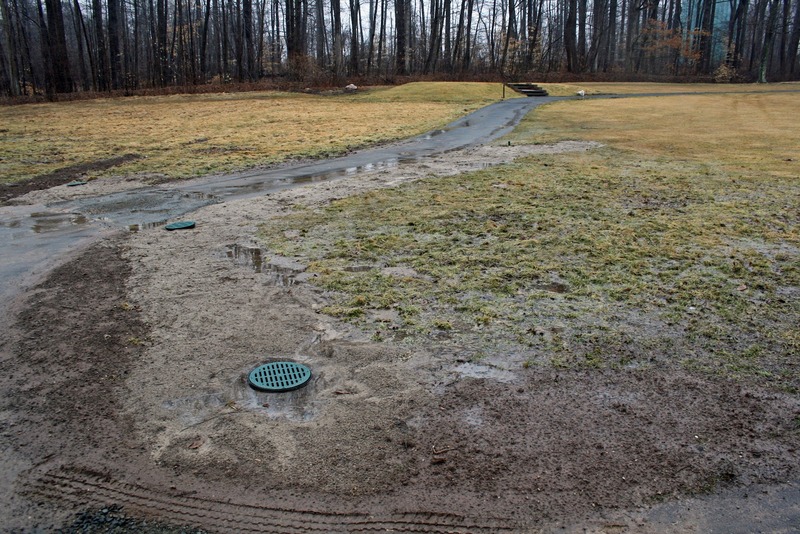 Area fixed between #15 tee & #17 fairway. Ready for seed. An additional project over the winter months was completed on the front of #13 green. 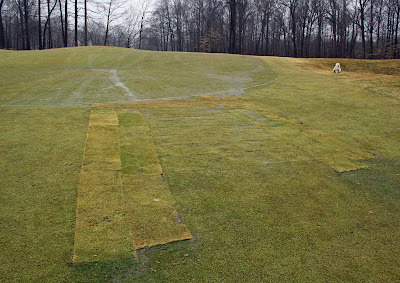 We stripped sod from the approach to allow water to flow off the green instead of collecting there. 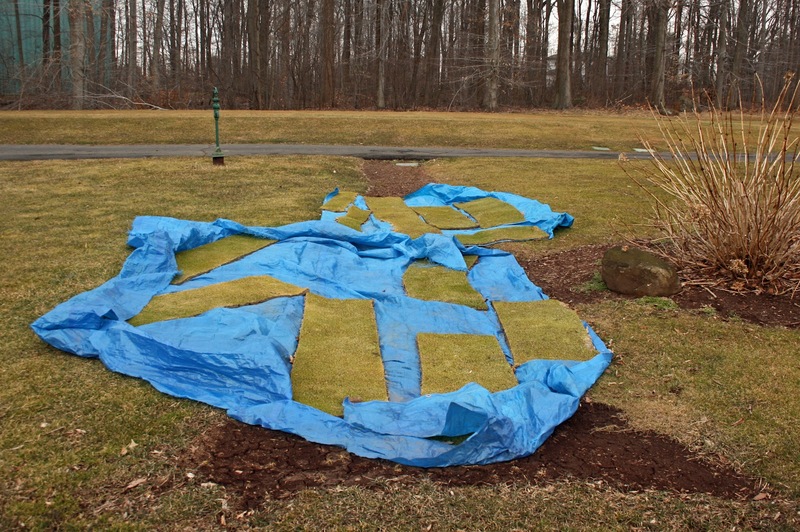 We stripped more sod in the last week of February and regraded it for a more permanent fix. 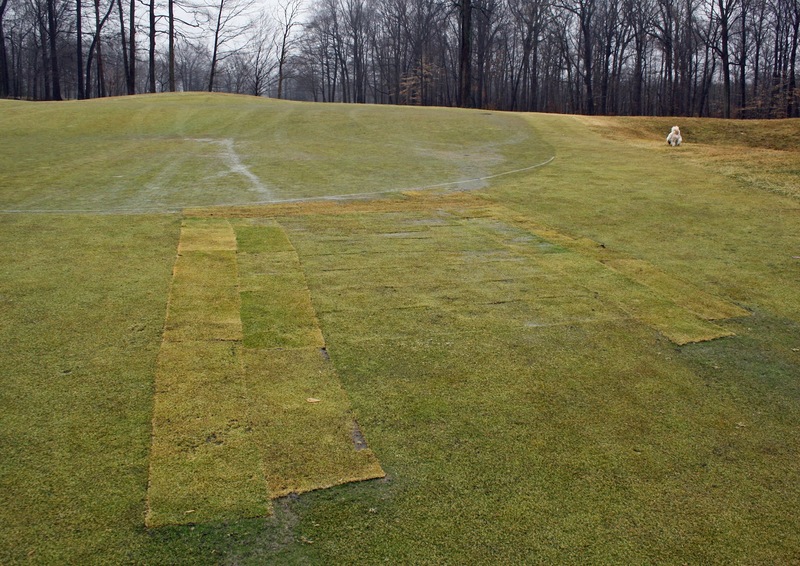 Sod strips removed in late fall. Notice sand that flowed out of stripped areas. 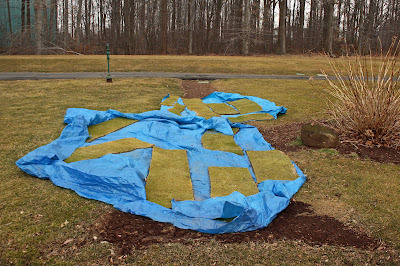 Removed sod laid on tarp for winter.